I'm excited to be linking up with my amazingly organized friend, Diane, at Fifth in the Middle, to discuss some tips on staying organized at the end of the year. I can honestly say that I am not the most organized person in the world. As a mother of a two and four year old, a fourth grade teacher to 46 ten year olds, a wife to a P.E. teacher, and a friend to many, I have a million lists running through my head allllll day long. Seriously, just while making dinner tonight, I had a constant check off list in my head. While trying to make pasta and realizing there was no sauce...I was thrown for a loop. To save yourself time and stress, I am compiling a few time saving, sanity giving, organizational skills in this post. Do you have to empty out your room at the end of the year? Unless we are moving rooms, we just have to make sure everything is basically off the walls and floor. Everything goes in piles on shelves, but to stay organized, I like to label...everything. Last year, we started keeping baskets for each unit. This has been awesome. 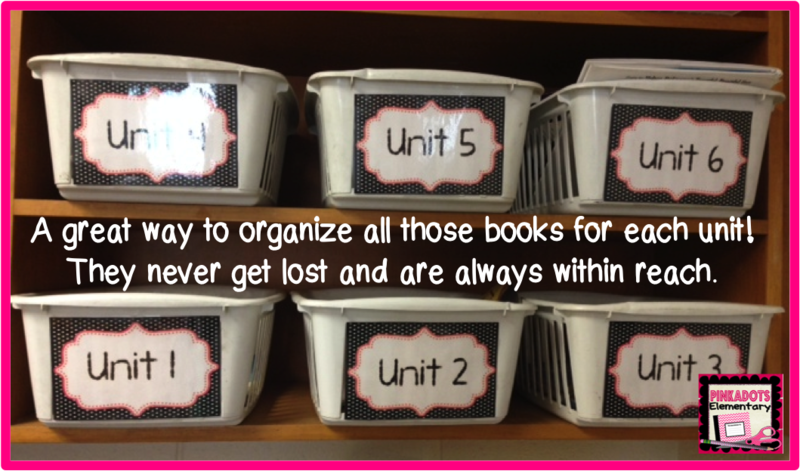 When we find books for each unit, when finished, we simply place them in the basket. 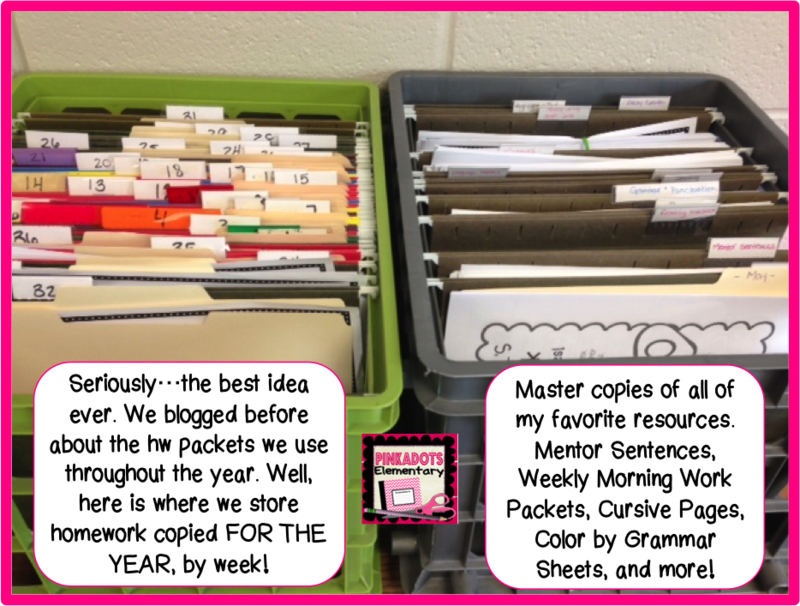 When it comes time to prep for the next unit, our memories of great lessons come back to us when we look in the labeled bins. 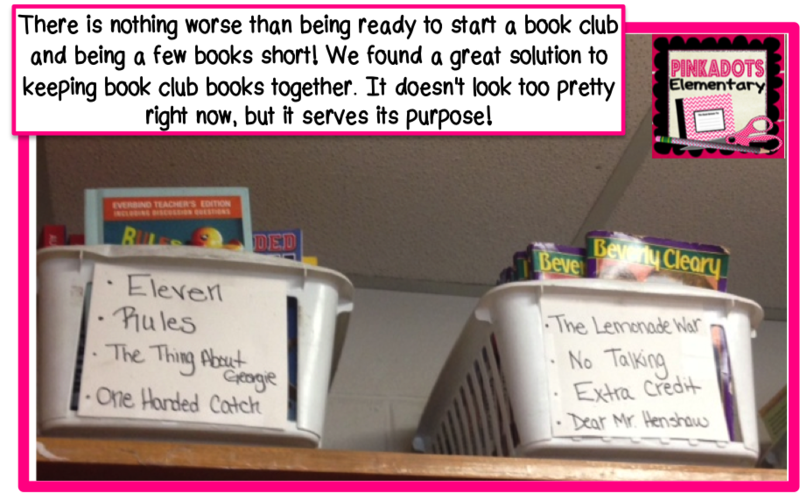 By keeping the bins organized, even when the room is a mess from the end of the year purge, my books never get lost or misplaced! Do you ever lose books at the end of the year? It seems like some of my favorites always go missing. I know a ton that stay at home with the students who "borrowed" them, but it drives me crazy when book club books go missing. I give all the credit in the next picture to Robyn. I laugh at her because she seriously has OCD, but I am always in her room grabbing from her organized resource bins. On the left we keep all of our copied homework packets for the WHOLE YEAR! This is created the first week of school and it saves SO much time. You know how all the parents are eager to volunteer when school starts? Give them a project like this and you will be thankful all year! We love our homework packets. They are meaningful, challenging, grade appropriate, and actually fun! When we take from the folder, we always leave an extra copy inside. Pretty soon the bin will be empty again and ready for easy copying! On the right are all of our master copies for our most used resources. It contains Jivey's Mentor Sentence Units, our Weekly Morning Work Packets, Cursive Pages, and a whole lot more. This makes it easy to keep a steady routine and we never have to go searching for papers. I hope my/Robyn's organizational tips have given you some ideas. Good luck with the end of your school year, I hope it is smooth and painless! I am off to finish my end of the year reflection! These are great tips! Parents are all ready to help at the beginning of the year, but not so much after a few months. Way to take advantage of that! Thanks for linking up! I love having your homework copied for the entire year at the beginning of the year when parents are eager to help!! Do you date the homework though? What if things get thrown off by a week?